This teaser is from page 94 of Randy Shilts’s The Mayor of Castro Street, a biography of Harvey Milk, which my partner and I are both reading right now. I’m only 40-some pages into it, and I’m enjoying the story bits more than the politics, which is typical for me – in books, and honestly in all aspects of life, my mind tends to wander off and get lost when too many names and dates are thrown my way. Rachel and I are both finding that this one reads quickly in some places and drags pretty significantly in others; Shilts’s style flops between journalistic and conversational, which seems to contribute directly to the “easiness” of the read in various spots. Though he tries to present the facts in a manner that is at once informative and engaging, he hasn’t much of a unique voice, in my opinion; it feels like more of a data dump than a storytelling, which is really too bad. Reading this definitely makes me want to watch Milk again, though, which is as good a reason as any to have picked it up. Maybe I’ll see if Rachel’s up for it when we both finish the book, and I’ll point you to her review over on Popcorn Popper. Also, linking to LibraryThing above made me realize that we own three copies of this book, and not one of them is in the catalog yet – must remedy the LT backlog! So how about you, what are you reading this fine Tuesday? Prompted by a post by a close friend on a topic very near and dear to me, I think I’m going to make Fridays my “learn a little about Kirsten” day as opposed to learning about the books I’m reading. I’ll provide a link to a post, or create my own, about something related to my identity, my community, my little piece of the world. Maybe it’ll be deep and thoughtful, like today’s, or maybe it’ll be a photo-journal entry of my and Rachel’s most recent visit. Maybe a rant about the latest injustice in the workplace, or a rave about the new cosmetic product I couldn’t resist. Hopefully it’ll be interesting, fun, and enjoyable in some way for you. 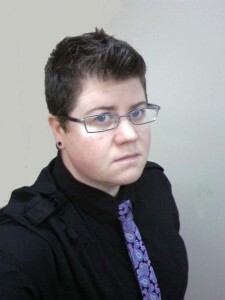 Today’s link is to my friend’s blog entitled The Sartorial Butch (pictured above – isn’t she dashing?). This particular post is a bit off-topic from her typical stuff, but it really resonated for me and made me reflect on the ways misogyny is not reserved for males/men. I hope you’ll take a moment to read this thought-provoking post, and let me know what you think. How can you relate to the topic even if the language is different from what you’re accustomed to in your community and daily life? Is this something you’ve thought about considerably and have opinions to share? Something you’ve never really stopped to think about, but can come up with instances where it applies? Head on over and drop a note, and let the SB know I sent you – take a look through her past posts, too; she’s got a fun blog with lots of useful hints and tips even for the non-butch-IDed among us. This comes from page 61 of Sarah Waters’s Tipping the Velvet, which I’m reading for either the second or third time. Waters is perhaps my favorite writer at the moment, though I can’t say for certain that she’s my favorite author. Definitely in the top five, or even three, but it’s more her voice, her way with words, that captivates me in every single sentence of every single novel than the story she tells. I enjoy all of the tales and plots, and count Fingersmith among my top books of all time, but I haven’t loved all of her books as fiercely thus far. How about you, whatcha readin’? Want to see if you can topple over Mt. TBR by throwing another one on the pile with your teaser?